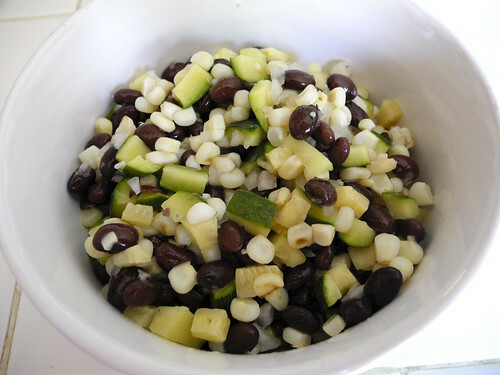 I was reading a recipe with chopped zucchini, corn and black beans and thought it sounded divine. Until I start reading the directions, you were supposed to saute everything. But right now I am in love with fresh raw zucchini. One of my favorite treats is hummus and raw zucchini chips, so good! When I first made this for a pot luck barbecue I made a big mistake I forgot to add the black beans. It was actually really good so if you want just a veggie side skip the black beans! Mix lemon juice, lemon zest, salt and garlic and poor over zucchini mixture.